I can’t believe I went so long without trying a beet! Beets are the most wonderful root vegetable – their colors are stunning, and when paired with goat cheese, they offer a perfect texture that balances out the soft, tart cheese. Nowadays, I can’t get enough of beets, and I generally order them whenever they are on a menu. Salads, sides, borscht. I’ve even had beets paired with a goat cheese panna cotta, an interesting, but not all together successful dish. But it was at a special birthday dinner when I tried a beet and black truffle risotto, that I was blown away. The color was a deep, almost blood red and the truffles added a dimension of decadence. I was determined to try a version of it at home. The first beet risotto I made was with a jar of sweet baby beets my parents had brought for me from one of their weekends away. It was good, but really much too sweet for a main meal. It would have made a very nice side to a roast pork tenderloin. 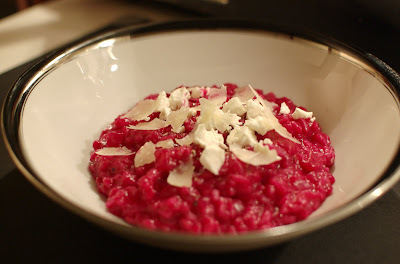 This second time though, I made the risotto with a can of beets – I have to admit, I’ve never tackled fresh beets at home. 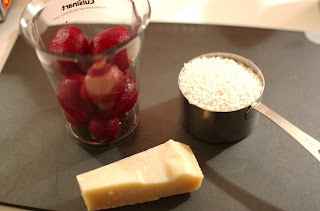 I pureed the beets and folded them into the risotto once it was cooked. The result was hot pink, but delicious. And then there was the really inspired part – I crumbled goat cheese on top! It was the same tart, sweet combination I love in the salad, but without the texture – it was delicious. Next time, I would go with more goat cheese, and maybe a few fresh herbs, but this is going to be a new standby – hot pink and all. In a medium sauce pan, bring the chicken stock to a boil and reduce to simmer over low heat. Melt butter in a large sauté pan over medium heat. Add the onions, reduce heat, and cook slowly until onions are soft and translucent. Add rice and stir for about a minute to toast. Add the wine, increase heat and simmer, stirring constantly until the pan is almost dry. This process should take about 30 minutes: Add enough stock to cover the surface of the rice, about 2 cups, and stir constantly until the liquid is mostly absorbed. Add another ½ cup of the stock, stirring constantly again until the liquid is mostly absorbed. Add the last ½ c. of stock and stir constantly until all of the liquid has been absorbed. At this point, the rice should be tender, but firm to the bite and the thickness should be similar to the consistency of mashed potatoes. If you like your risotto less al dente, continue to cook, adding a ½ cup of boiling water at a time until you reach the desired consistency. Remove the pan from the heat. Quickly puree the beets. Add the parmesan to the risotto and combine. Fold in the beet puree until completely combined. Add salt and pepper to taste. Plate the risotto and crumble the goat cheese on top. Garnish with more parmesan, parsley, and pepper. I think you should tackle fresh beets! They're not so hard, a little messy because of the color, but fresh beets are just too delicious (and one of the only things available fresh in the winter!... at least out here) And I agree, beets and goat cheese is the most genius combination! Can't wait to try out this beet/goat cheese recipe! Sar beat me to it! But we LOVE LOVE fresh beets and goat cheese. We got very creative last winter and came up with all kinds of beet creations: Beetza, beetzadillas, abeetizers... the list goes on. Can't wait to try this one!